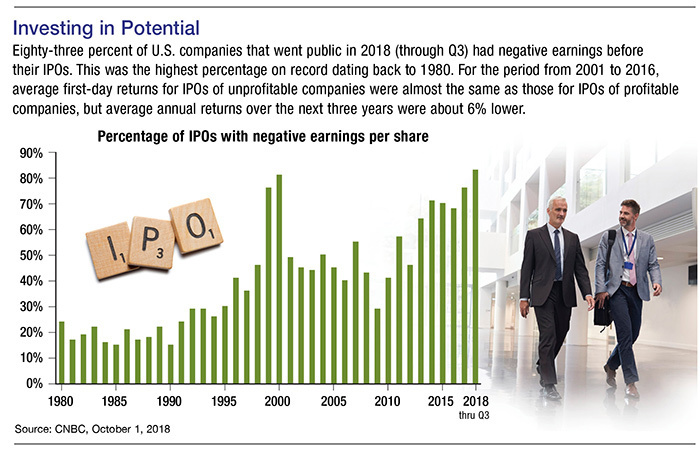 Although IPOs can sound enticing to an average investor, company insiders may have the most to gain from a public offering. The higher the price set on IPO shares, the more money the company and its executives, employees, and early investors stand to make. Even so, the IPO process is important to the financial markets and to investors in general, because it helps fuel the growth of young companies and adds new stocks to the pool of potential investment opportunities. When IPO share prices shoot up on the first day of exchange trading, it’s referred to as a “pop.” A significant first-day gain may suggest that investor demand for the company’s shares was underestimated. Of course, this doesn’t mean that the company will outperform its peers in the long run. One catch is that it is often difficult to obtain “allocated” shares that can be purchased at the IPO offering price, the price at which insiders are selling to the market. Investors who don’t have the opportunity to buy shares at the offering price can buy the stock after it starts trading on the exchange. However, much of an IPO’s pop can occur between its pricing and the first stock trade. This means investors who buy shares after trading starts often miss out on a large part of the appreciation. Investors who buy IPO shares on the first day might even pay inflated prices, because that’s when media coverage, public interest, and demand for the stock may be greatest. Share prices often drop in the weeks following a large first-day gain as the excitement dies down and fundamental performance measures such as revenues and profits take center stage. A young company may have a limited track record, and an established one might have to disclose more information to investors after it becomes publicly traded. If you’re interested in the stock of a newly public company, you should have a relatively high risk tolerance, because shares can be especially volatile in the first few months after an IPO. You might consider waiting until you can evaluate at least two quarters of earnings. Careful research is important for all investments, but recent IPOs may require a higher level of scrutiny. The return and principal value of all stocks fluctuate with changes in market conditions. Shares, when sold, may be worth more or less than their original cost. Investments offering the potential for higher rates of return also involve a higher degree of risk. Registered Representative offer securities and advisory services through Royal Alliance Associates, Inc. Member FINRA/SIPC. Representatives may not be registered to provide securities and advisory services in all states. PLEASE NOTE: The information being provided is strictly as a courtesy. When you link to any of the web sites provided here, you are leaving this web site. We make no representation as to the completeness or accuracy of information provided at these web sites. Nor is the company liable for any direct or indirect technical or system issues or any consequences arising out of your access to or your use of third-party technologies, web sites, information and programs made available through this web site. When you access one of these web sites, you are leaving our web site and assume total responsibility and risk for your use of the web sites you are linking to.